Breathalyzer company BACtrack teamed up with VinePair to compile a map showing the states who drink the most. By measuring the average blood alcohol content of various states, West Virginia, Nevada, and Pennsylvania came out with the highest. 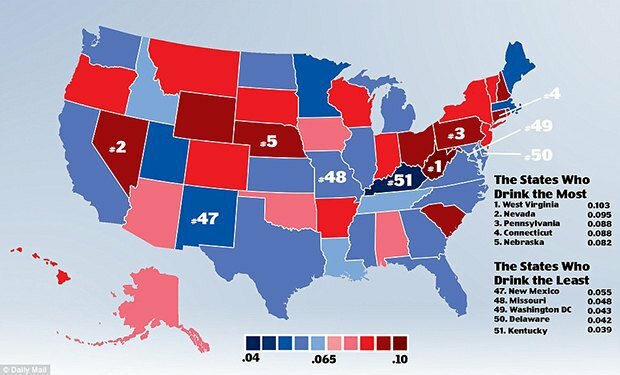 Kentucky, Delaware, and Washington, D.C. are at the lowest. The study also revealed that Americans drink the least from July-August, from which thereafter consumption speeds up again. A separate study also reveals that Washington had the most amount of tweets about wine and beer, followed by second most about liquor.